Rock Paper Lizard: Sun dog. Sun! It was a bright, crisp day, perfect for a bike ride. Here in November you have to make the most of any gap in the rain. A friend who immigrated from northeastern China two years ago told me he now wants to move to Toronto, because he can't stand the Pacific Northwest's persistently dreary fall, winter, and spring. Months of depressing, grey weather. Weather here is a cinderblock wall. Take me with you, I almost said. I was on the Shell Road trail, which borders blueberry fields. Fire engines passed in the distance, sirens on, and in response coyotes among the blueberry rows started to sing. I love when they do that. Usually you don't see them, but this time they were close to the trail, which you can't tell from the photo above. And maybe not from this one either. I had quickly braked and de-biked, grabbed my camera from my pack, popped off the lens cap, but failed to disable the autofocus, which was enamored with the branches in the foreground. The sirens faded and the coyotes stopped singing. 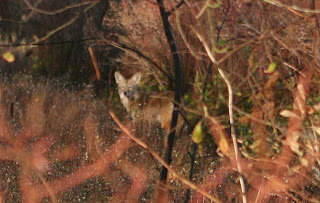 Just before they vanished, the camera found a pair of sunlit ears. 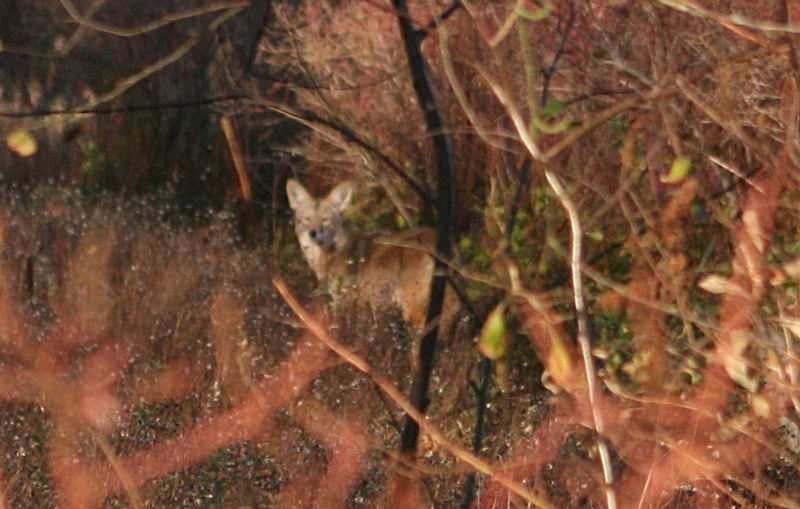 I played "spot the coyote" in the second last photo, but I had to cheat and look at the last one. Then I went back and saw the obvious two ears in the middle pictures. It's very alert after its performance.